a couple of years ago it was pretty simple... the 8374 or the 9180.
we now have 6 turbos heading upwards powerwise from the 8374 and i am getting lots of head scratching and in some case regretful decisions. notice the 8474 is nowhere near the 8374 as to output. while it is close to the 9180 as to output, it shares the same turbine wheel as the 8374! SX-E 66 87 pounds of air. if BW had continued to use the 6.31 area wheel the ratio would have been 13.78. They elected to use (only) the 7.15 wheel making the ratio 12.16 which is similar to the 8374 and 9180.
general best power (on gas) EGT for a piston engine is 1322 F. rotaries are about 300 higher. i find 100 F lower EGTs and 20% less back pressure with the larger hotside wheel. if you are going for the higher end of the dual purpose scale (around 600) i prefer the 9180 over the 8474 or 9174. * power calculation using max flow efficiency post as per BW suggestion... rather than max rpm. Last edited by Howard Coleman CPR; 04-13-19 at 03:13 PM. It is a reasonable range now however I feel they are missing a compressor inducer between 67 and 74 that would be a better compromise between response and outright power on the larger turbine, you could probably argue similar on the smaller 74 too. Should provide a better choice and extend potential power for packaging of each anyway. Interesting info, I'm considering updating my setup from my gen2 6766. At first I was thinking the 9180, but the idea of quicker spool with more power under the curve is very enticing. In theory, the 8474 seems perfect for my needs/wants. My current setup was street tuned to 32psi (somewhere in 600+whp). The last Dyno I had was at 20psi where it made 489whp with a slipping clutch on a mustang dyno. Unfortunately I don't have any data logging equipment to verify spool time or back pressure, but it is very fun and seems responsive and doesn't seem to be an issue. The 8474 sounds like it would provide the same power, but more of it everywhere due to the lighter wheels (turbine of the 8474 seems to be the same size as my 6766 if I'm understanding properly with a compressor that has the same size inducer and smaller exducer compared to a 6766) . If I went this route, I wanted to do the iwg set up to simplify everything and lower maintenance items (I've already had to replace wastegate diaphragms twice is about 7 years, absolute pain on a rerouted wastegate to exhaust system). Would the 8474 not be suitable or cause too much back pressure to be ran in the 30psi range and still keep quicker spool than the 9180? Does the 8474 really outflow the 9180 by that much? How is this possible? Its a smaller wheel is it not? as you can see the 8474 makes 92 pounds per minute. as far as i am concerned the question is what's with driving this monster cold side w a small turbine wheel. i will call my BW guy tomorrow and get some answers. "updating my setup from my gen2 6766. At first I was thinking the 9180, but the idea of quicker spool with more power under the curve is very enticing. Would the 8474 not be suitable or cause too much back pressure to be ran in the 30psi range and still keep quicker spool than the 9180?" "I would also like to know how spool/back-pressure would be on a 9180 vs 8474 as it relates to a rotary....."
"Does the 8474 really outflow the 9180 by that much? How is this possible? Its a smaller wheel is it not?" your 6766 GEN 2 will make 700 rotary rwhp. 93.5 PPM / 6 = 15.58 so the turbine wheel is on the small side for the output similar to the 8474 (15.56). 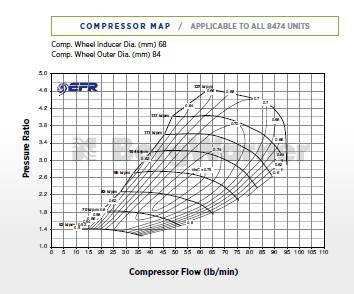 compressor area is 7.1 on the 8474 and 7.51 on the Precision so the BW is more efficient as to output V wheel size. worth noting is the Trim on the 8474 is very large at 65... meaning the compressor inducer area is 65% of the exducer. this is on the far edge of the scale and favors top end at the expense of midrange. in theory the 40% lighter turbine wheel should give it a spool advantage... Dan Barlog, the key engineer at Precision told me that they tested the titanium aluminide and found they could not shape it into their ultimate configuration so they "picked flow over weight." you may choose to believe this or not but Dan is a serious engineer and Precision is on the cutting edge of design as they do not have to jump through the OE design constraints. a key question as you contemplate midrange or dynamic spool is how the lighter hot wheel nets out against a very clearly biased to top end Trim number. i would not dismiss this dynamic as you may not be happy with 2000 F EGTs as a tradeoff for more (maybe) midrange. all this is speculation on my part but if true, and i think it is most probable, you will have no fix. i had a discussion w one of the top BW engineers as to the 9180 and 8474 re my October Texas Mile run. he was very clear that the 9180 would be the better turbo as the motor needs to get the exhaust out to keep EGTs and backpressure as low as possible as after the first quarter mile i shift into 5th gear and am in 5th for 17 seconds just under the 600 rwhp area. he was very clear on his advice. first off, if you are losing diaphragms the fix is not an internal wastegate. as turbos climb in output and especially midrange delivery wastegates become waay more important as to efficacy. i remain skeptical that any internal wastegate will offer the control of a Tial external. other factors as wastegate performance are of course manifold design. it simply depends on where your diaphragm locates in relationship to heat. Last edited by Howard Coleman CPR; 04-17-19 at 09:09 AM. "What do you think about the 9280 on a 3 rotor"
the 9280 is a 829 rotary rwhp turbo... maxxed out you would be at 552 2 rotor which is a reasonable rotary power level for longevity. since the compressor is pretty large (8.36 sq inches) and is powered by the same 80 mm (7.15) wheel as the smaller 9180 the hot cold relationship is on the wrong side of the relationship at 15.38.
the compressor Trim is 66 not favoring midrange but because you have 50% more motor driving the turbo that is not a problem. so powerwise, pretty nice, just a concern as to hotsize V coldsize and EGTs. I got a 9180 on 3 rotor and it is dumb, blows tires out into 4th. But then again I do run a greddy red spring. Still want to try a 9280 at some point. So at what rpm you start making boost? I am willing to try it as some point as long as my tuner is ready to do the transatlantic flight again ! Wow, this is a lot of info. So in theory the 8474 would be good, but at the cost of higher back pressure and egts compared to a 9180 (thus canceling out any benefits at the cost of more stress). I wish the technology on the wheels didn't limit things. A theoretical 8480 sounds like it would be a monster. Any idea of a back pressure estimate comparison between 9180 and the new 9280? Will entirely depend on manifold specs, primarily runner size and length, and the size of the hot side housing. Volume and pressure are directly related. I believe the hot side wheels are the same between the two so turbo to turbo there shouldnt be any difference on the same manifold and housing, and even if they're different the wheel size effects of backpressure are minimal compared to the effects of volume. If you have a manifold and hot side that's sized correctly for your port and power level it will stay under a 1:1 ratio with intake pressure regardless of the increase in mass flow from a slightly larger compressor, which is why backpresure matters in a high overlap engine in the first place. I'm at full boost the second I put full load on the engine on the engine dyno, though I'm sitting at a mild 21 psi. I don't bother loading it up below 3000 rpm either. BorgWarner EFR turbos in STOCK!